The ATTO ThunderLink® NS 3101 acts as an external Thunderbolt 3 to 10GbE adapter, connecting Thunderbolt enabled systems (all-in-ones, workbooks, mobile workstations) to 10Gb/s Ethernet networks and storage devices. When faced with the challenge of architecting solutions that allow guaranteed delivery and easy deployment into your workflow ATTO ThunderLink®'s provide a purpose built solution. 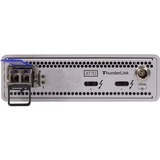 With 10Gb/s data transfer rates, Ethernet ThunderLink®s are the connectivity choice for bandwidth-intensive applications such as data back-up and restoration, clustered computing, IP content delivery, medical imaging, and video rendering. Now, the time tested combination of ATTO and 10GbE is being integrated with the latest in cutting edge high performance Thunderbolt 3 connectivity.